There’s lots of different models: pay-per-listen, paid subscription, crowd-funding, advertisements and donations. The key for producers is developing a model that works for the story and doesn’t take more effort to manage than it brings in. 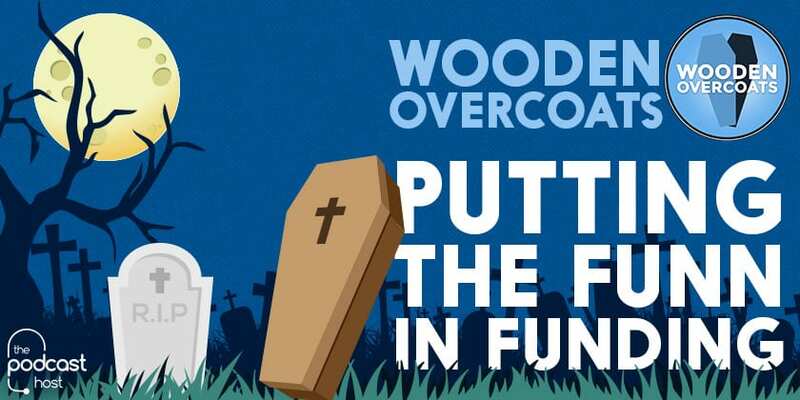 Besides being a smash success among listeners, Wooden Overcoats – a comedy about rival funeral firms (odd-ball Funn Funerals verses the charming Eric Chapman) – is a great example of a production that’s brought together a number of funding techniques in a way that really enhances the production. As many new producers have found, growing an audience from nothing is hard and getting voluntary donations is even harder, often requiring several seasons to break even. Wooden Overcoats writer David K Barnes came at this problem from a different perspective than the traditional focus on digital media. Drawing on a background in theatre, he and the team of professional actors and directors developed the novel approach of both staging performances live, while also recording in the studio for podcast audiences. This turned out to be a shrew move. Podcasts of live theatre productions is an approach frequently used in comedy. Wireless Theatre Company, Starlight Radio Dreams and even the BBC use this as great way to generate income, raise visibility and loyalty amongst fans. But by releasing the podcast as a studio production, listeners get a sharper sound and producers have material they can use elsewhere. After a positive reception for the first season, including reviews in The Telegraph, Wired Magazine and on local radio stations, the team turned towards crowd-funding to establish a fully-funded second season. For many podcasts, the Patreon direct debit site has become the preferred platform for generating income. High profile productions like Wolf 359 have succeeded in generating $2,000 per month income. This is a solid basis for production, but following more than 40 episodes and 1 million downloads, it can be a steep climb. Wooden Overcoats instead choose to run a funding campaign through Kickstarter, as it held the opportunity to raise a big enough sum to plan a whole series. We’re Alive is the best known example of how this can work, raising $55,000 in 2015. Still, this can be a gamble and We’re Alive took years to build the fan base. Often campaigns for audio dramas fail because there’s no physical product to entice donors and large number of subscribers won’t necessary translate to funding. Yet the Overcoats team did have something to offer fans with a resource of live material it could release, together with splendid ideas like maps of the ‘Piffling island’ setting and personalised poetry reading by cast members. Potential donors got something that was fun, unique and impossible to get elsewhere. Face-to-face contact from performances and launch parties meant fans were more generous to the show, while media coverage (helped by the presence of big name stars in the cast) gave the team the momentum to raise £10,000 for the second season. Done well, advertisements can be another essential part of fundraising. Establishing content for Patreon sites or Kickstarter campaigns can be painfully time intensive. Ads on the other hand often require a lot less input, with an established structure of platforms and networks sourcing clients for podcasts with high listener figures. Yet it can be a double-edged sword for fiction writers. Besides the need to push listener surveys, too many ill-judged ads for socks or, as A Scottish Podcast expertly lampoons – hemorrhoid cream – can see fans pressing the unsubscribe button. Playwright David and directors Andy Goddard and John Wakefield recognised this and after establishing contacts with client, Bruno Mattresses, they establish some in-world comic sketches. It worked perfectly because the tone of the sketches chimed perfectly with the manic quality of the show. Like the ads in The No Sleep Podcast they are a listening experience all by themselves. By bringing together performances, crowd-funding, advertisements, advanced episode donations and merchandising physical cassettes, Wooden Overcoats (again with unique material) enabled the team to succeed in making a fully-funded production and adding to the quirky, theatrical charm of the series. Yet, as David makes clear, even fully funded it remained an exhausting labour of love with the core team working long hours and others offering their time for free. £10,000 sounds like a lot, but when compared to the £23,000 the BBC spends per hour, it obvious that it requires a lot of running just to stand still. Ultimately the true value of the show may not be the money it makes, but instead the shop window it provides for the talents of the cast. The professionalism of the production and the fan’s deep love for the actors make the team hot property. As such, cast are currently involved in a number of theatre productions, podcasts, acting and voice work. As for the BBC or indeed Audible, it’s hard to believe there’s a commissioner there who hasn’t heard of this bright new comedy which has featured in The Times, The Telegraph, The Observer and Wired Magazine. Consider what you want to achieve first. Is it to fund a story, to develop a production company or to sell the talents of the people involved? Different priorities require different strategies. Where possible, a funding strategy should enhance the show and provide new avenues for listeners to engage with it. Don’t just focus on digital fundraising. Theatres, mainstream media and events are all ways of gaining publicity through other channels, broadening opportunities for income and gaining a personal contact with potential donors. Big names actors or supporters can be an important door-opener for curious listeners or journalists looking for an angle. Above all, fund-raising should be fun. Producing a drama is exhausting enough – if producing additional material or managing campaigns take you away from what you love, consider if it really is sustainable. Richard Brooks is Researcher at Coventry University focusing on innovation and entrepreneurship in the creative sectors. 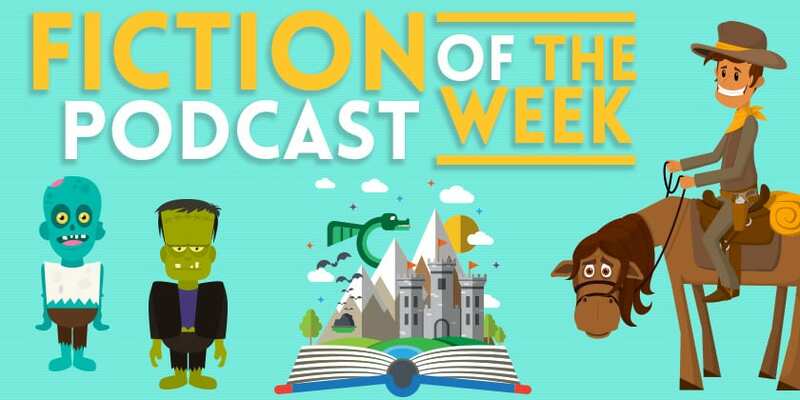 He currently manages a 20 university research programme looking at how new ideas become commercial success.Richard is a life-long fan of audio fiction and has written in a number of national and international publications, as well as giving talks on audio drama’s revival. In his spare time he acts and writes short-stories and scripts. Should I Sponsor a Podcast?